Industry remains fairly devoted to current practices and believes in-line measurement is not as accurate as the fixed CMM in climate controlled temperature regulated quality lab. The key role of embedded metrology, today, is not to displace CMM but shows if the production line is running well or not and identifies failures early in the process. Non-contact metrology is important for the smart factory solution because a measuring device does not have to be manoeuvred in to measure or touch the part. Measurement is performed at distance with no interruption to production. But in a flexible factory with mobile production cells, scanners can be moved and operated by robots. 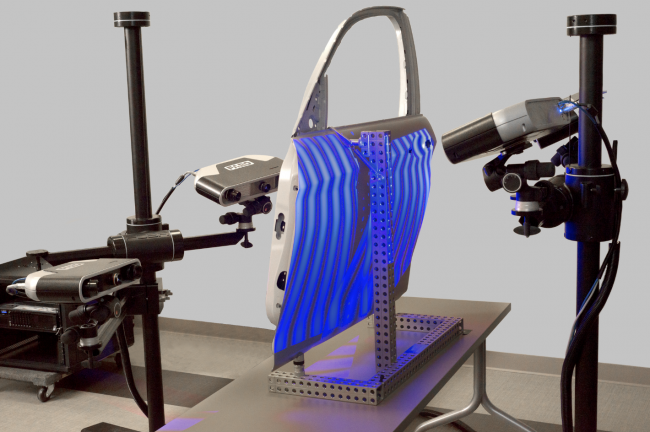 The main types of scanning technologies used in factories include laser scanning, phase based laser scanning and optical interferometers. The challenge is that non-contact metrology tends to be slower, requiring manual and accurate positioning during manufacture. The strobe angle of the optic can be affected by reflections – or optical diffraction – and there are other practical challenges. Specifically. for example, what is the capability for high dynamic range measurement, the ability to move equipment away from the workpiece and measure from distance? The research community are investigating how to solve these challenges. But until the accuracy and speed issues of non-contact are resolved, touch probes have a strong place in the smart factory. Robotic operations are accurate, repeatable, tireless, and have flexibility. Robotic measurement is better for high volume production than multiple manual interventions. For example, automated robotic measurement can be better for some applications than a static system on a fast production line and can be set up to measure multiple points. The sweet spot for robotic inspection is the 100-micron tolerance area and above. In this range, errors of a robot machining system can be compared with a normal machine tool as a fair comparison and the robots’ ability to move provides the flexibility. The main factor for robot-compatibility is the degree of precision an application needs. 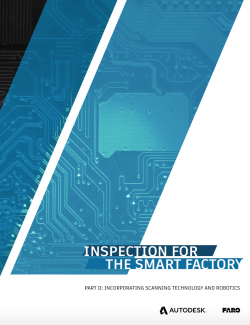 This white paper by FARO and Autodesk, the second in a four-paper series on Inspection for the Smart Factory, assesses the status quo of best practice factory metrology, the types of scanning technology and benefits of robot flexibility, and how measurement needs to transform to enable truly smart, digital factory operations. It includes a case study on SYMPLEXITY, an EU-funded multi-partner project, which shows how these technologies combine to robotically automate a previously highly manual process – polishing large metallic areas.